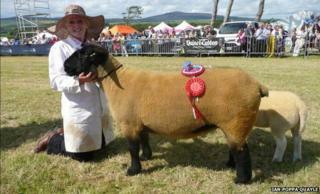 A record 13,000 people attended the 101st Southern Agricultural Show's opening day on Saturday, organisers have said. But the event's secretary Sarah Comish said that may have been the case due to the vast majority timing their visit to avoid the dreadful weather on Sunday. She said: "We experienced two extremes but Saturday was the busiest we have ever seen our show field." Only about 100 visitors braved the driving rain on Sunday. A ewe owned by the Kermode family from Orrisdale was crowned Supreme Champion. The sheep was chosen ahead of hundreds of animals from all over the Isle of Man. The two-day celebration of Manx agriculture was held at Great Meadow and saw the unveiling of a 10ft (3m) high sculpture of a bull crowned "supreme champion" during last year's centenary event. Artist Darren Jackson's design, chosen by the public, is made from assorted "farming treasure". As well as classes for traditional livestock, the weekend included local food and craft stalls, vintage machinery, children's entertainment and dog shows.